The rate of performance of all the tasks studied increased uniformly as movement amplitude was decreased and as tolerance limits were extended. Fitts’ experiments comprised of reciprocally tapping using a stylus, transferring discs from one spindle to another, and transferring pins from one set of holes to a different set of holes. 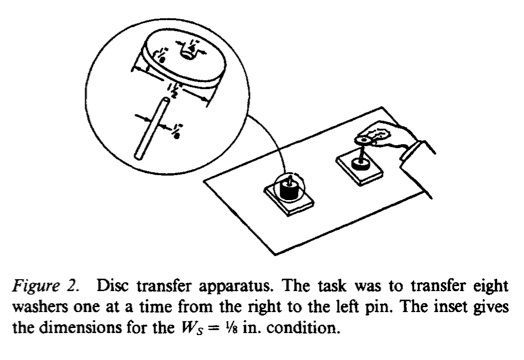 From the results reciprocal tapping was found to be the easiest while disk transfer was the most difficult. The key aspect of this work is not the extent of the studies – using hundreds of participants for one specific protocol – but the combination of three experimental protocols coupled with small user groups. Each protocol produces results which will support the findings of the others – that performance increases when the required movement decreases and the tolerance allowed increases. The fact that three small studies with three separate methodologies and protocols produce similar results is key to understanding that there is an ecologically valid real world system at work with practical significance in regard to movement and control. This means that Fitts can derive a mathematical algorithm which represents the system to a very accurate level which enables human factors specialists today to make predictions about eye-hand coordination with regard to the movement of pointing devices and other motor based input systems.